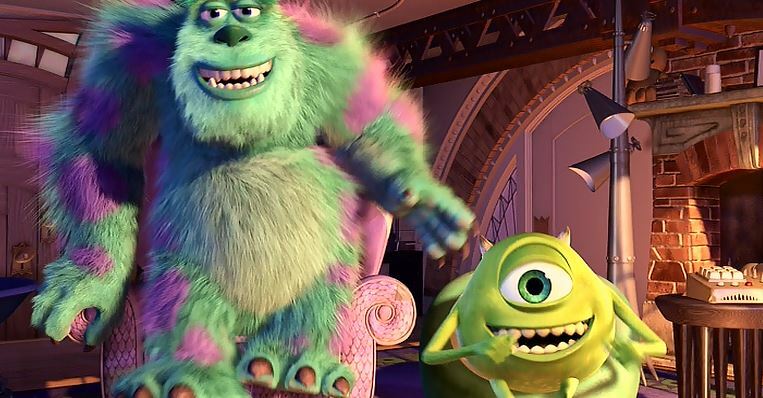 Two workers at Monsters, Inc. are our main characters: Sulley, voiced by John Goodman, and Mike, voiced by Billy Crystal. Everything’s going well for them until a young 2-year-old human girl manages to get herself immersed in the monster world. Then, panic and hilarity ensue. The creativity of the monsters is pretty ingenious creating a plethora of memorable characters. But, my forgotten/minor character appears later on in the film. When Mike and Sulley disguise the human girl as a monster to sneak her into Monsters, Inc., they bump into a woman monster there who has a few kids with her. Now, my question is, who the heck is this woman and what is she doing there with kids? This building is an important utility building which I would presume wouldn’t allow every random monster to just walk in and tour around! Then, can we infer that this woman works here? If so, why did she bring these kids who may or may not be hers? Judging by the lack of genetic similarity between this woman and these kids, I think it’s safe to say that these kids are not hers. Unless, they’re all from different fathers…now that’s an image I didn’t need in my head. Or is she like a professional babysitter that the company hired to take care of some of the employees’ kids during working hours? If so, Monsters, Inc. treats its employees much better than some human companies do! Or is she like a teacher who brought these kids here on a field trip? If so, what interest would these young preschool kids have with an electric company? I feel most of them aren’t even potty-trained! Especially that little blue one at the left. I don’t think it’s a trail of slime that he leaves behind. Another interesting theory revolves around the fact that to explain their bringing a kid monster in the place, Sulley and Mike say it’s because of a “Bring an Obscure Relative to Work Day”, which they obviously made up. Or did they? Maybe there IS such a day and Sulley and Mike serendipitously made up that truthful lie on the correct day! Hence, that could explain this lady bringing her kids to work with her. If these kids are obscure relatives of hers, then that would totally explain the lack of genetic similarity between her and the kids. I dunno…the point is, her placement in this film boggles me, albeit minor, so I had to devote a post to her. What do y’all think? Love your posts like these, Mark! Ooo, lots of interesting theories. My favorite is the “Bring an obscure relative to work” day, and maybe she brought four instead of one! It seems like a Pixar move to subtly add that in after Mike brings up that day, haha. Great post! Thanks! I enjoyed doing this Forgotten/Minor Characters Project with the Disney Canon, so doing it with the Pixar films just seemed like the next step forward. Yeah, I really wanna know who the heck this woman is, lol. I always thought it was the babysitter thing – like an in-house daycare for employees. You’re right, definitely an awesome perk for the employees! Yeah, I don’t have a job, so I’m ignorant about it. But, do companies provide in-house daycare for their employees? Fun post. Monsters Inc is brilliant. I am a huge Pixar fan. I dont even hate Cars 2. It has problems but I like parts. 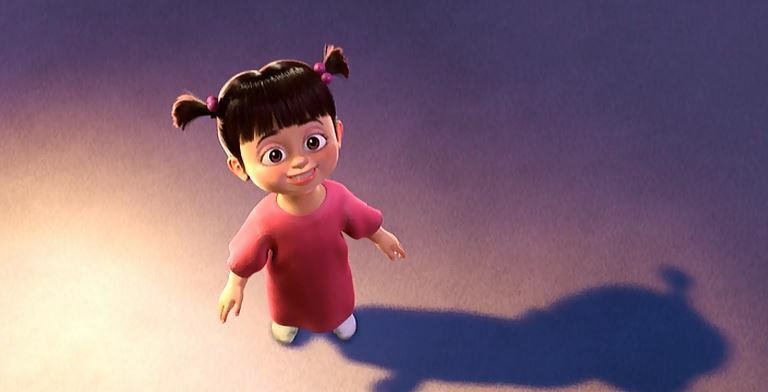 Anyway, Boo is so cute. I love Mike and Sullys friendship and the door shtick is fun. I don’t think I hate ‘Cars 2’ either; I just can’t remember it. Well, there wasn’t much to say about the monsters at the sushi restaurant. I think everyone knows what the octopus is doing there and what the photographer is doing there, etc. This is the first movie that I remember watching in the theaters, so it has a special place in my heart. I think the forgotten character is definitely a babysitter. This is a very good film, and should have won Best Animated Feature over Shrek, but it is definitely not the best Pixar film. It deff should have beaten out ‘Shrek’. The kids kinda look like the children of some of the monsters working there, so the babysitter theory might be a possibility. This film is really good. The characters are engaging, the plot is well-done, and the character designs for the background monsters are a ton of fun to look at. While I haven’t seen Shrek in a while, I will say that this film is more creative and clever, so I agree that this should’ve won over Shrek. I’d agree with most people that Monsters University isn’t quite as good as this one, but I thoroughly enjoyed that, as well. Agree with everything you’ve said! Great! Which Pixar films would make up the rest of your top 5? Uh…Toy Story 3 is #2, but I haven’t thought hard enough to decipher the other three. These kids are some of the scarers kids. She’s just the daycare teacher. That blue slug que looks like Roz’s grandson, that octopus guy looks like one of the scares( presumably his son/daughter) the fat green monster looks like me bile, the monster who screws up hid test simulator at the start of the movie, and that last guy looks like one of the scarers assistants. Previous Previous post: Review For ‘The Haunted Mansion’ Is Up! Next Next post: ‘The Boxtrolls’ Opens At #3!